Wine Cooler or Cache Pot in Geologic. The color pattern on the exterior results from layers of colored clay that are reacting to the heat and flame of the firing process. It makes me think of the many organic layers that were layed down and compressed over eons to produce the oil , gas and coal that we use today. That's why I choose to use a deep black temmoku glaze to cover the interior, rims and handles of this pot. It is 11" tall and 10" wide. 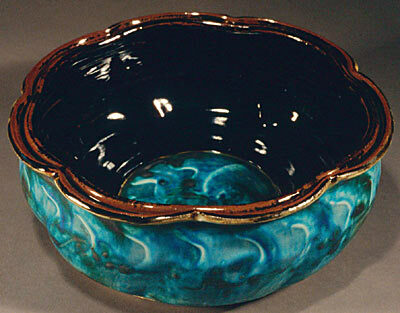 Crimped Bowl with split rim featuring a center mandala. 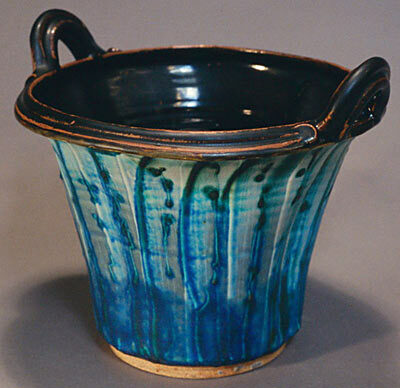 This piece is done in Geologic with a temmoku glaze. It is 11" wide and 4" tall. 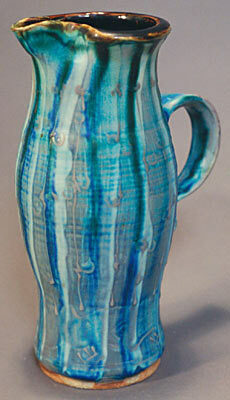 Birds Mouth pitcher in Geologic with Temmoku Glaze. It is 9" tall and holds 1 quart.